Cors Scout Coil – Our Review With The Minelab E-Trac! Sometimes it would seem like “why do we need additional coils for the metal detector?” Isn’t it enough with the standard coil? Naturally, it is not enough, especially when it comes to sniper coils or large coils from 13″ and up to 15″ in diameter. But there is another question – why change the standard coil for an additional coil of a third-party manufacturer, if the difference in size is not so obvious? In our case, the 11 “coil from Minelab worked perfectly in the fields, but it became interesting if we could squeeze the maximum out of the regular size of the additional coil, and if this would increase the finds on an “empty” field? Not for reconnaissance, where there is enough with the coil of 13″, but namely for “empty” fields, which we have already passed with our detector several times. An interesting experiment, right? Especially if there is a small budget for such an experiment. ? 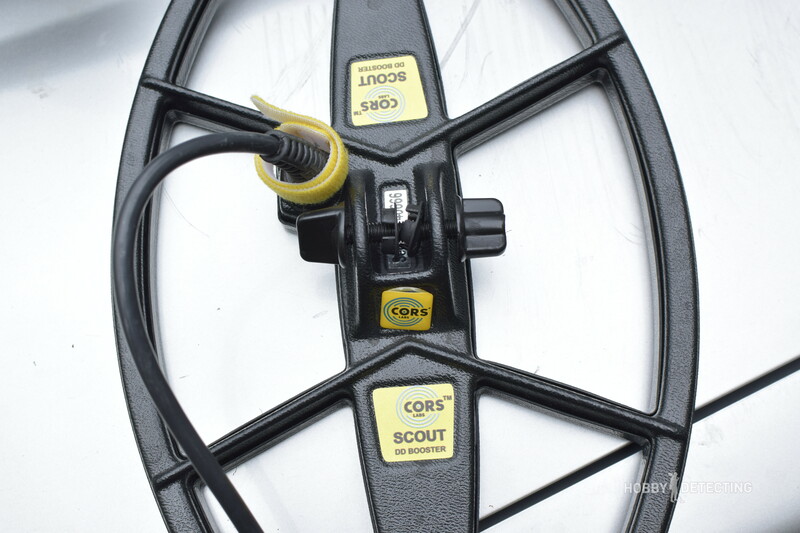 We went over several variants of coils from different manufacturers, compared prices, looked at the situation on the market and decided that the best option for us was to buy a Cors Scout for our metal detector Minelab E-Trac. 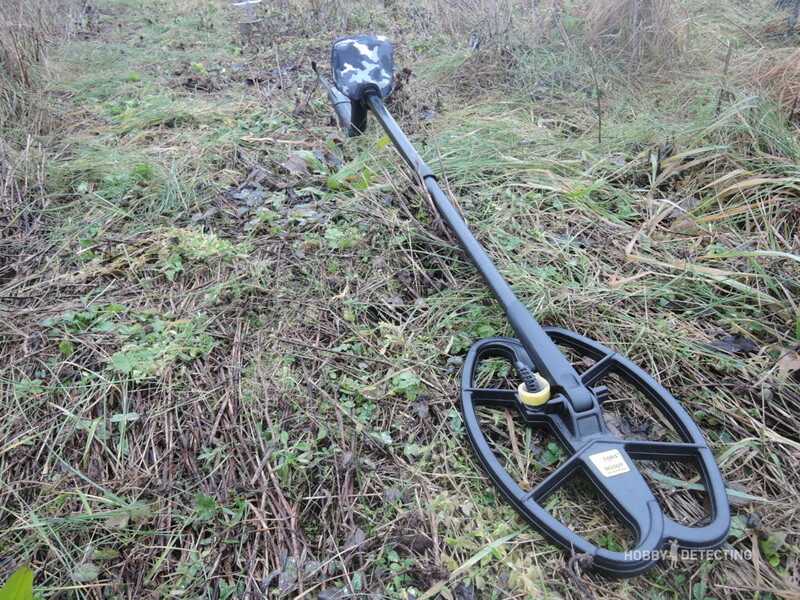 Someone will call it an old detector, but this machine will still be a competitor to many modern metal detectors! 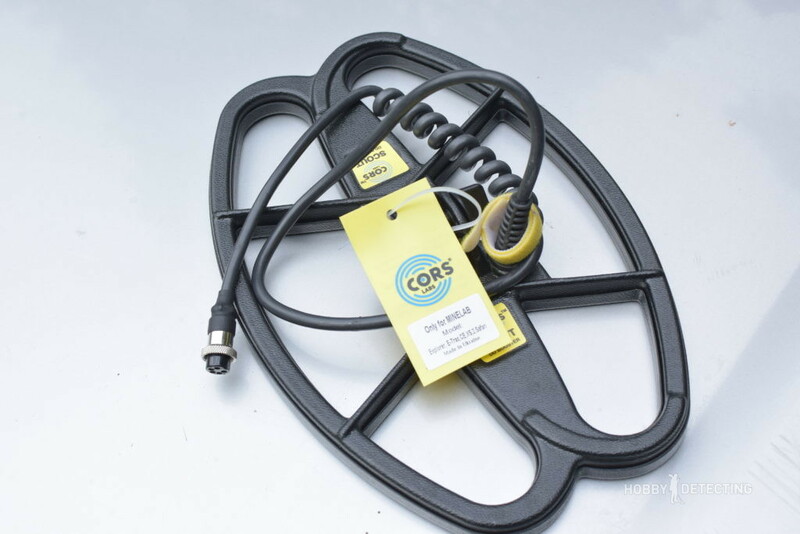 The coil came in a yellow box and saw the light exactly in this form – with the label where the model/brand is written and for which series of metal detectors it is intended. Also, despite the fact that the wire on the E-Trac is hidden inside the bar, this coil had a Velcro to attach the wire to the rod. Standard equipment, the Velcro will come in handy! Also included was a bolt and seals for the ears of the coil. In short, this kit contains only the most necessary items. The coil weighs 490 and does not at all seem heavy. The size of the coil is 12.5″ x 8.5″, which is slightly larger than the stock coil but is more compact in width. I would love to use such a coil on my old Ace, but since it has been sold for a long time, and more professional models have come to replace it, we have high expectations for this coil – after all, the Minelab E-Trak is a deep detector, and the manufacturer promised that the DD Booster should give a small but incremental depth, which is what we need in places where a large-sized coil can not be used because of the presence of a large amount of metal debris, among which we must dig all more or less positive signals. You will not find anything there, this field has been detected for 25 years already, there’s no point in going there. 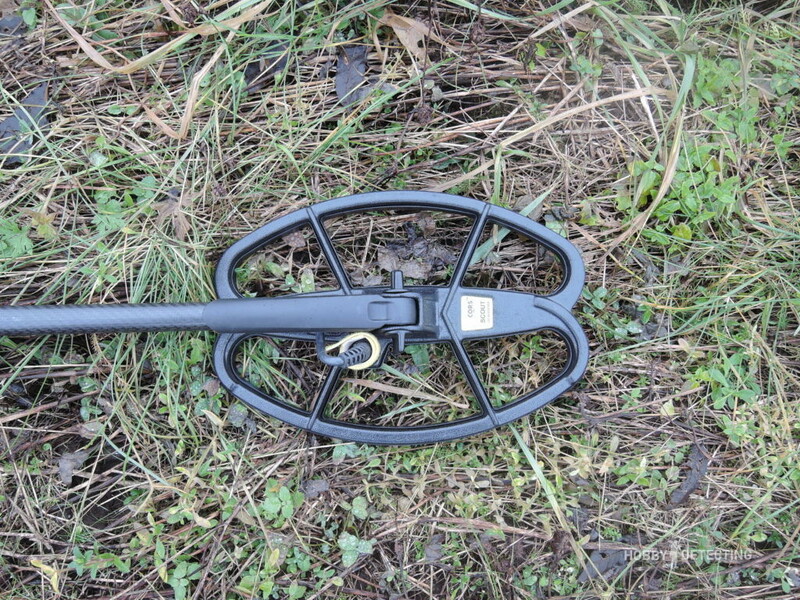 Hundreds of detectorists have there, and you will just waste your time. I would even write the name of the one said this, but I will not. ? I do not believe in “empty fields”, because that what has been lost for thousands of years, can not be found during a couple of decades. That’s the field itself. Quite large and ancient, life here has been hovering for more than 2000 years and not far from this place there are forbidden places for detecting, where ancient fields and settlements with burial grounds have been found – everything dates back to the Iron Age, and this was almost 3000 years ago! Can such a field be empty? Naturally not, something must be there! With these thoughts, I uncovered my metal detector and put on the coil. The coil on the E-Trac should be equipped in a special way – the wire is quite bulky and to pass it you need to take a small nylon thread and tie it around the plug of the coil, pass through the bar and only then pull and pass the entire wire inside the bar. Just do not try to do it with only your hands – it will not work. Bolts and seals secure the ears of the coil securely and prevent the coil from loosening freely in any direction. But the main thing here is to know the limit and not to tighten the ears of the coil too much. But I personally think that the coil ears will not break, because they have a very solid construction. However, it’s time to go to the road and check the coil on this place. The first hour and a half surprised me – some garbage signals and objects of iron. The E-Trac saw perfectly deep signals and discriminated well. I detected, unfortunately, without headphones, but the volume was twisted at the maximum. Also, the device was set up precisely for slow and quiet work in depth, and everything that came up was not detected by other diggers – some pieces of equipment, forged nails and rusty trash from the depths, but I was digging it all just to check that the discrimination on the E-Trac is not mistaken and correctly identifies the objects. Suddenly, among the occasional grunts, there was a sound higher in tone, but it was quite quiet, that I checked it two or three times and only then saw the value on the screen. Well, it looks like a small coin, you have to dig. Of course, I was delighted, because I had been walking for an hour and a half and digging rubbish, but the find was really small and deep. I dug out more ground from the center of the pit. 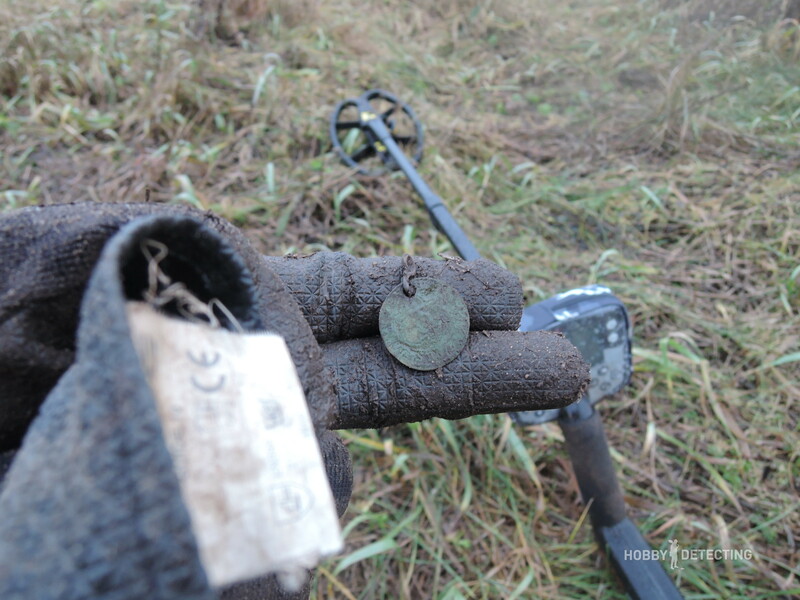 A little witchcraft with a pinpointer and the find appeared as I thought – it’s a small coin! I rubbed a little and there was a year. Well, I got a coin from 1953 as the first find. The year of Stalin’s death, therefore I so easily remembered the year of the find. Well, the field was not completely empty and old finds can still be there, so I needed to continue searching. After this coin, I still wandered for an hour and only found iron and rubbish. Interesting signals were not present at all – that’s what it means to have diggers on this field for more than 20 years. The benefit of this field is that it is near the city, the road is close, it’s easy to go and dig. But there were some more interesting signals that I dug out in the hope of finding coins. But the finds were ordinary buttons, one of them was with an interesting design and was clearly made at the turn of the mid-19th century. 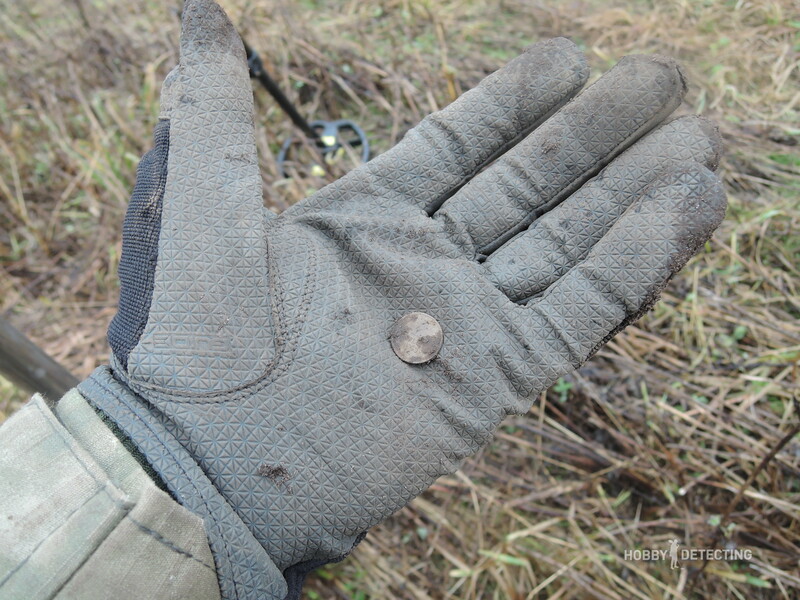 Where there are buttons – there are also coins, and buttons on an “empty” field are also a good find, won’t you agree? I went on and began to look for new signals. It began to rain, a cold and unpleasant rain that began to cloud the place, but I decided not to give up and go until the last until I find the real old finds. And I found it. In the middle of the field, I got a good and interesting signal. The detector showed that it is quite possible that this coin was stable and very deep. I dug almost a foundation pit because with a small hole in the depths I could not get close. In one hand I had the shovel, and in the other hand, I had the pinpointer. And there it was, the find in the little shovel. It is a pity that it was in such a condition, but it turned out to be a Nuremberg Counting Token of the 16th century! Yes, such a cool thing, as it turned out later after the identification of it, it was minted in the middle of the 1550s, in Nuremberg and with some cheerful inscription in Old German, which has yet to be deciphered and translated. The field still keeps finds, and somewhere deep the coins still lie waiting. Then the rain became even stronger, so I had to move to a warm and dry place, drink hot tea. 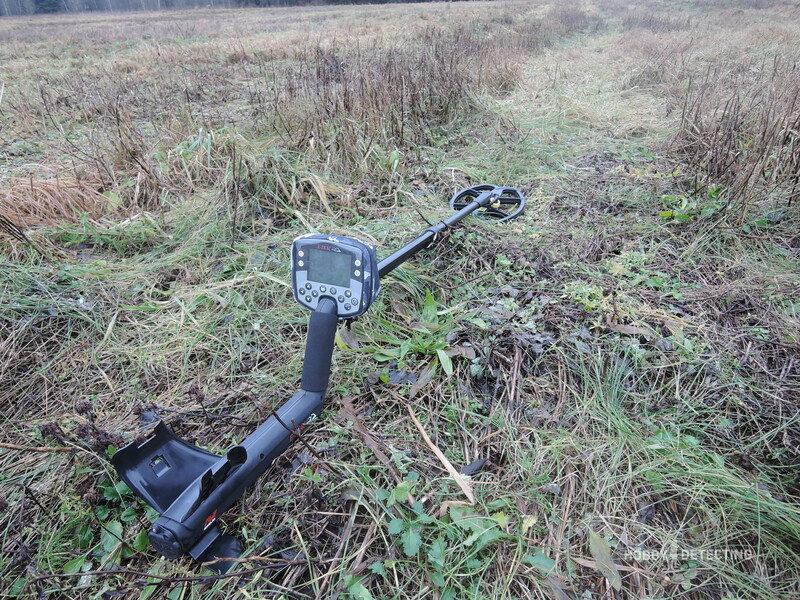 Of course, the Minelab E-Trac is a deep device. Let it be slow, not suitable for reconnaissance (for this you have the Deus or F75), but with a tremendously working discriminator (you almost never make mistakes) and a good pinpointing function (the most accurate one I have seen). 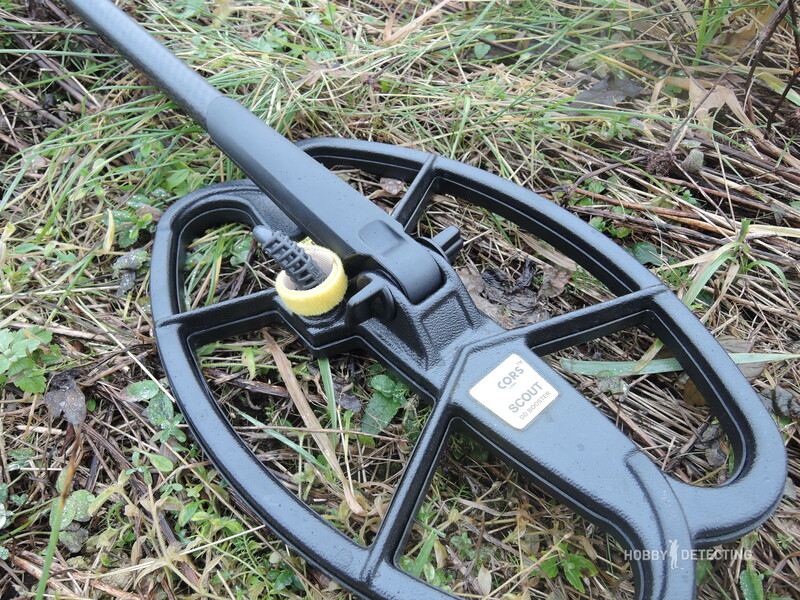 In combination with the Cors Scout, the result is a good detector for places where there is still enough iron in the ground, but where it is necessary to see potential interesting objects among all this. The field was also difficult in terms of the ground, in places the stones prevented me from digging normally, but the E-Trac with the Cors Scout pulled out an antique button among these stones. 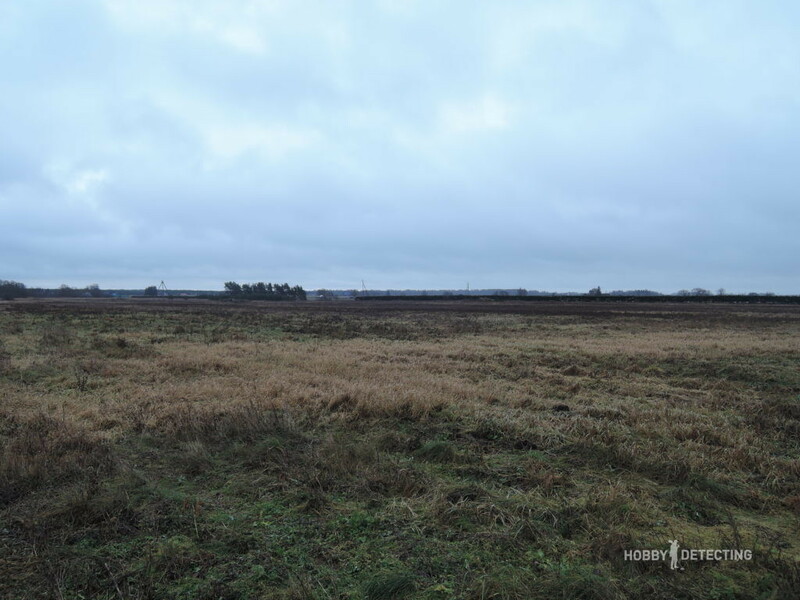 Cors Scout is perfect for detecting on the beach, for example, or in places where there used to be a village or a settlement, and where there now is a lot of garbage in the ground. The coil will give both depth and sufficient coverage of the sweeps. What can I say? Coil replacement is very often necessary, and such a coil as the Cors Scout is perfect for replacing the regular coil on any metal detector, especially if you have a metal detector that is inexpensive, and for a more expensive detectors you do not have enough budget, then you can take a coil that gives your metal detector additional depth and sensitivity. Now, while there is winter and all the fields are covered with snow, I have nothing to do but to look at these photos and clean the finds. I think that I will I return to that field in the spring, to the place where I found the old counting token, to check for coins there.